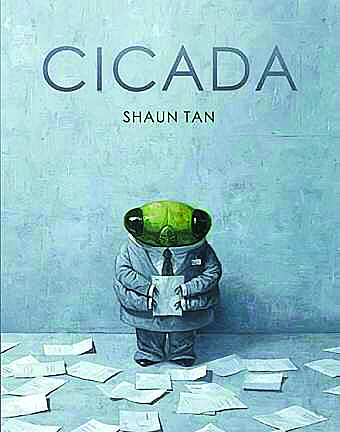 I follow one of my local children’s book shops on social media and was very excited when they posted about Shaun Tan’s new book, Cicada. Intrigued, I bought myself a copy and sat down eagerly to devour it … and was left a bit confused. What did it mean? What was the point of this story? It’s a bit dark … Now I feel a bit depressed … Could I use this book, with its broken English, in a classroom setting? I was underwhelmed. But knowing the reputation Tan has as an author and illustrator, and the knowledge that his books always have more to give each time they are re-read, I flipped straight back to the beginning. Tan is an award-winning author and illustrator. In 2011, he won an Academy award for the film adaption of his picture book The Lost Thing. His books are always highly anticipated and praised for their depth, richness, complexity and imagination. Tan does not shy away from difficult subjects, exploring both the good and bad sides of humanity – including exclusion, abuse of power, the human need to aspire to something bigger, and the importance of relationships. The concept of work. What is work? Is work to be enjoyed or is it a means to an end? How did humanity get to the point of being stuck on the grey, corporate hamster wheel that can so easily consume us? Acknowledgement. Why bother working so hard if no one is going to notice and appreciate the effort we put in? How does one sustain the integrity needed to avoid falling into the mindset of putting in the least amount of effort in order to get by? What happened to taking pride in one’s work? Freedom. Is it only for weekends? How much power do these “suits” actually hold over us? Discrimination and bullying. Do I partake in casual racism based on the way someone speaks, looks or acts? Would I have the courage to stand up for someone who was being ostracised? Would I stand up for someone if it meant my own job or safety was at risk? But the theme I like most (suggested by Tan, himself), is attitude. Is Cicada depressed by his situation? Or is his personal catchphrase (“Tok Tok Tok”) actually laughter at the human condition and our willingness to put up with the drudgery? Is he better able to cope than others because he has hope in a future he knows is coming, in which he will be set free? All these themes are suggestions. Tan, as always, never tells us what to think, rather throws out an idea, suggestion, provocation or confrontation that encourages us to think and challenges the norm. And today’s world could surely benefit from that.